“Second screen,” “companion devices,” “cross-platform marketing” — there is a myriad of terms that have popped up recently that refer to dividing your attention between multiple screens. Marketers have realized that the relatively mundane habit of looking at your phone while watching television is an opportunity to get creative about marketing across different platforms. Consumers probably don’t realize how much time they actually spend on a second device, and how much marketing on the other device can influence how they see commercials on the “main” device. The Nielsen Company has some survey data confirming what we can see around us: Many TV viewers are using a computing device of some kind while they watch. Last October, Nielsen said 40 percent of smartphone and tablet owners in the United States self-reported that they used their devices daily while watching TV. What does this mean for marketers? Should they choose one device or the other? Should they split their budgets and do half as much advertising but on both devices? Last year, Nielsen released a study it did for Google in which subjects were shown a 15-second commercial for a sports sedan. Of those who saw the ad only on television, half were able to recall the name of the manufacturer. Of those who saw it at different times on four screens — television, computer, smartphone and tablet — about three-quarters remembered the name. Not only have researchers studied how consumers absorb information on multiple screens, but they have also noted the importance of the order of device usage. With this information available, marketers have choreographed cross-platform advertising campaigns and many apps have already gotten in on the second-screen game. Some of the new apps can recognize all the shows you may be watching on the major networks, based on what’s called their audio fingerprint. These apps then display options that can include related photos, live chats, tweets or user polls. Other apps require you to manually select a show before you can see such choices. A quick search for phone apps will bring up some of the most popular “second-device” apps. Yap.TV bills itself as the “perfect TV watching companion.” IMDB’s app was developed knowing that its most popular usage was for looking up information while watching television. IntoNow allows you to share your favorite TV shows and films with friends. 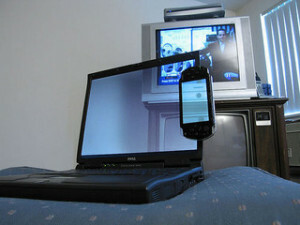 Television shows and networks have added bonus material on their websites that are readily available for mobile streaming. The rise of “companion devices” means that companies need to keep up with the demand of having a presence across multiple platforms, or risk being left in the dust by competitors. What’s the bottom line for marketers, and how much should they invest in second-screen advertising? Earlier this week the MMA put out a report that argued (based on ROI considerations) that advertisers should devote 7 percent of their advertising budgets to mobile. That modest recommendation fails to fully reflect the central importance of mobile now: brands and marketers must ensure that their campaigns and creative assets are fully optimized for mobile consumers.